Before 2018 I was not very involved politically. That’s all changed this year. I’ve become more engaged politically that I ever have before. I want to explain why. First, let’s talk about what I’ve never done before. I’ve always been politically aware. I’ve always voted. Always did my research and tried to intelligently vote for every possible office. I’ve even blogged about politics and talked about local candidates. I had opinions. But that’s about as far as it went. Before 2017, I never called my representatives. Before 2018, I never donated to politicians. Before 2018, I balked at the idea of door knocking for a candidate. Before 2018, I never marched in a parade with a political candidate. I’m not sure I had ever met a politician in person before 2016. Maybe in elementary school when we toured the Michigan state capitol. I never attended a city council meeting (or any other governmental gathering) before 2017. Before 2018, the only political yard sign we’ve ever had was one supporting a school board referendum—once. But in 2017, and especially 2018, I did all of those things. I attended a city council meeting and spoke during citizen comments (I’ve now done that so many times I’ve lost count). I called my representatives. So many times. I’ve met my city council, mayor, and state reps, and they all know me by name. I participated in a caucus and district convention. A forest of political signs has appeared in my front yard. I’ve donated to multiple political campaigns. I’ve door knocked for multiple political campaigns. I’ve marched in parades for multiple political campaigns. I’ve met and talked with candidates for state legislature, Congress, and governor. I don’t say any of that to brag. If for some reason it sounds like bragging, it’s actually incredibly easy. I’ve had candidates for governor and Congress call me—all I did was ask questions. I say all this because I want you to understand that getting involved is not that hard. I’ve been politically vocal in the past. Though it mostly involved blogging and tweeting. And I said some stupid things that I regret. So that made me cautious. I wanted to find common ground with people and I didn’t want to be incredibly divisive. Through most of 2016 I stayed pretty quiet. And like a lot of people, I deeply regret that. The election of Donald Trump has ushered in a new era of political insanity. I don’t say that lightly. I don’t say that to be partisan. I say that because Donald Trump has torched any kind of political norm we had. Defending or dismissing gross and unethical behavior in order to maintain political power is simply wrong. And I’ve realized that I can’t just sit quietly on the sidelines. I’ve also realized that sitting loud and obnoxious on the sidelines isn’t any good either. I went to meetings. I talked to people. I asked questions. I volunteered. As I did all of those things this summer as we approached the primary, a dreadful realization dawned on me. I was campaigning hard for a governor candidate in a three-way race and a city council candidate in a four-way race. That governor candidate was behind in every poll. Losing was a very real possibility. I wondered how I’d feel about all the time and effort I put into campaigning if my candidate lost. How dumb would I feel if I wasted all that time? In the moment, I soberly considered it. Then I decided I’d rather be all in for a candidate I’m excited about, and whatever happens, happens. Well, we split the difference: One candidate lost and the other won. But really, it was a win all the way around. In the city council race, my candidate—Wendy Berry—won. She led the four-way race and now moves on to the general election so we can do it again. That felt pretty good. My candidate for governor—Erin Murphy—lost. But rather than feel like I wasted my time on Erin Murphy, I’m proud. I’m proud of the race she ran and the person she is. 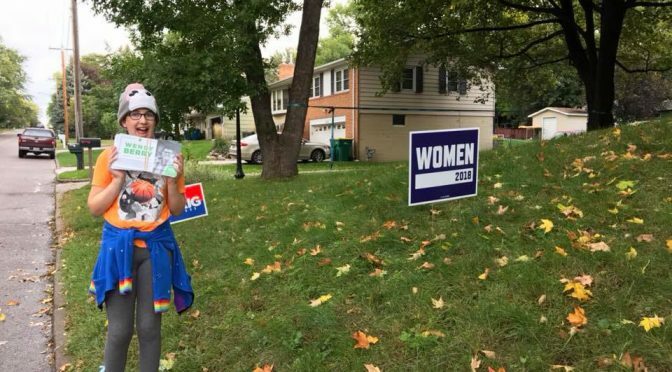 I’ve still got my yard sign and I’m going to hang it on my garage wall for posterity (between a Mad Max movie poster and a Black Lives Matter protest sign). The #PoliticsOfJoy that Erin (both Erins) embodied is something that will live on. Now I understand why people still have Bernie Sanders signs and stickers. I’m saying all this more for myself than for you. I’m saying it because I want to remind myself why I did all of this in 2018. I’m saying it because I want to have a record of what motivated me in this time. I’m still leery of being divisive. I don’t want to be another partisan who contributes to the gridlock. But that doesn’t mean I can’t have an opinion and express it. It’s why I try to be fair in my arguments, statements, questions, and actions. I’ve written critically about candidates—very critically in some cases—but I think I’ve also been fair. Lying, misleading, obfuscating, exaggerating—I don’t have time for that crap. Politics can be a messy and frustrating business. There are often complex issues and powerful emotions involved. Sometimes it can be impossible to get to the truth of an issue. It’s always easier to talk about and harder to do, but I think it’s the goal. And in general, I think people respond to that. Door knocking always terrified me. But once I got out there and did it (with my daughter in tow—she made me practice as we walked between houses), I found myself energized by talking to people. Having conversations and asking people what they cared about, sharing my perspective and why I liked a candidate—that somehow made politics more personal. I don’t know if it will make a difference. But I’d rather try. I’d rather do my part to make things better than sit around and complain. And you know what? It’s easier than I thought. The mid-terms are coming. It’s not too late to go door knocking for the first time. Or phone banking or donating or calling a friend—whatever you’re willing to do. Let’s not be people who sit around and complain all the time, feeling despondent and hopeless. Yeah, I get that you’re busy. I am too. Somehow I found the time. So do what you can. Help make a difference. Do your part in this moment. Previous PostMedians & Roundabouts—Oh My: Where Do 2018 West St. Paul Candidates Stand?Next PostAre National Politicians Talking About West St. Paul? Your posts make me think. Thanks for the time you put in to them. Mary: Hey, thanks for reading. Sometimes these things are more for me than they are for anyone else, but I’m glad people see value in them. Thanks.